Overview: You’re out enjoying a lovely camping weekend, when bears show up at the campground. What do you do? Shoot at the bears, run from your tent, or just ignore the fuss and keep on sleeping? Bears! is a new game from Fireside Games that’ll keep you hopping. Rating: Simple but fun, good for a quick filler (between rounds of Castle Panic, perhaps?) or while you’re actually out camping. Who Will Like It? Because of the simplicity and short length of the game, I’d recommend this one mostly as a quick grab-and-go type game. It’s one you can play with younger kids, and if you get more than one set you can have a big pile of dice for lots of players. But for more serious gamers, Bears! is more of a light snack. Campsite in the middle, five black dice per player. Camping! For a simple game, Bears! sticks to its theme pretty well. You can shoot bears, run away from the tent, or sleep in the tent. That’s about it. Of course, as a dice game it also doesn’t necessarily feel like you’re really at a campsite, but you do get a good amount of frenzied action since it’s not a turn-based game. The game includes 20 white camp dice, 20 black player dice, 4 scoring reminder cards, and instructions. The dice are slightly smaller than your average d6, and you’ll notice from the top photo that the box is actually quite large compared to the contents. This bothered me at first (particularly when packing games for PAX) but then while playing I realized that it makes a pretty handy cup for rolling all the camp dice. The dice are nice quality, with the icons engraved and painted on the faces. The reminder cards are handy when you’re first teaching the game, but after the first round you probably won’t need them anymore. Valid combos: shoot a bear, run from a tent, sleep in a tent. One player rolls all of the camp dice (5 per player) in the center of the table. 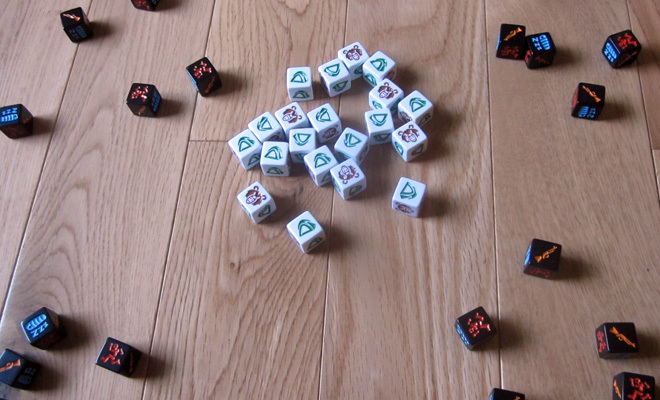 Then, all players roll five black player dice simultaneously, and start to look for matches — there are no turns. If you find a camp die that matches one of your player dice, you grab it from the center and pair it next to one of your player dice. At any time you can re-roll any of your player dice that haven’t already been paired. If you take the last bear or the last tent from the campsite, you shout “Bears!” and the round is over, and everyone has to stop. Here are the valid combinations: Gun + Bear, Runner + Tent, and Sleeper + Tent. Unpaired dice do not score anything, and incorrect pairs lose a point. You play until somebody reaches 100 points (or set your own goal, or play a set number of rounds). There’s also a variant with player elimination: “I Don’t Have to Be Faster Than the Bear, I Just Have to Be Faster Than You.” In this one, there are no Guns or Sleepers — you only match Runners to Tents. (Re-roll anything else.) Everyone rolls and tries to get as many Runners and Tents paired up as possible. At the end of a round, whoever has the fewest Runner+Tent pairs is eliminated. You remove 5 camp dice for that player and continue until only one player remains. Bears! is a very simple game that manages to be a lot of fun. Both my daughters really enjoyed playing it, though I must add that they had an attack of the sillies and started purposely making incorrect pairs: “Now I’m sleeping on the bear!” Neither of them had any trouble picking up the rules, though the four-year-old was at a disadvantage trying to keep up with the speed of the older players. 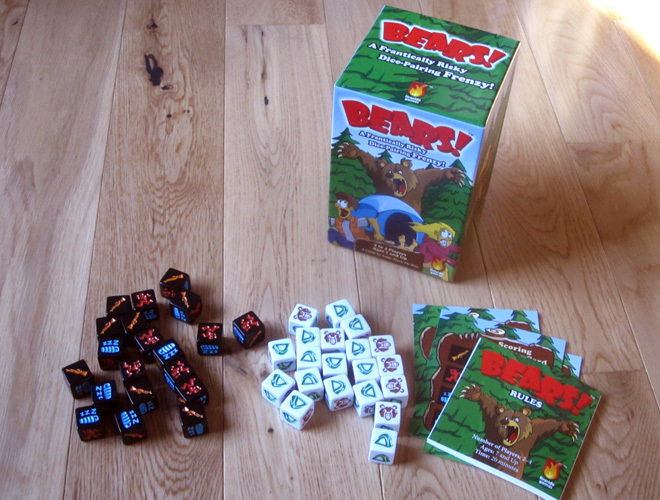 There is a bit of strategy even though each round goes so quickly that you won’t have a ton of time to ponder it: since sleepers only get points if there are no bears left in the campsite, you don’t want to use them if there are too many bears. But if everyone is going for sleepers in tents and nobody shoots the bears, then all the sleepers lose points. You can decide how much to press your luck — go for the guaranteed (but lower) score, or take a risk for higher points. It’s a quick game to teach, and I even took it on a camping trip. Since it’s just dice in a box, there’s not really much that can get ruined at a campsite (aside from the box, I suppose) and it’s pretty portable. The retail price does seem a bit high for such a simple game, but compared to Zombie Dice (another favorite) it’s more than three times as many dice for a few bucks more. If you like the camping theme (and you don’t mind the image of shooting at bears), Bears! is a fun filler game. I wouldn’t put it at the top of my all-time favorites, but it’ll probably hit the table pretty often since it’s so quick to pick up and play. Bears! isn’t quite available yet, but will be released at the end of this month, so watch for it at your local game stores and online. Wired: Nice quality dice, easy to teach, quick to play, fast-paced with a hint of strategy. Tired: Might seem a little pricey for its size.